Police at San Diego State University Sunday were investigating a break-in at the school’s Black Resource Center. University officials announced in a Facebook post that the center, located on Lindo Paseo just west of Campanile Drive, had been vandalized at some point since Friday evening. A television was found broken and some items were moved around inside the building, SDSU spokeswoman LaMonica Everett-Haynes said in an email. No staff were present when the incident occurred, and it wasn’t discovered until Sunday morning. 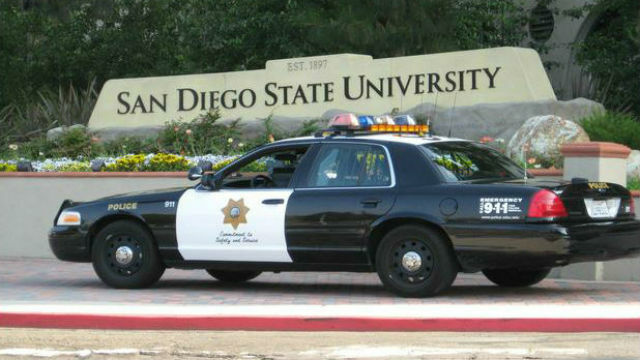 “SDSU focuses on providing an environment of safety and respect for all community members and does not tolerate this type of behavior,” the university’s statement said. In an email to the campus community, SDSU Chief Diversity Officer J. Luke Wood said additional safety measures have already been put into place at the Black Resource Center since the start of the spring semester, and more were in the works — including an increase in university police patrols around the center. “Incidents such as that which has occurred at the BRC do not minimize our commitment to our community — they strengthen them,” Wood said in the email. Officials asked anyone with information on the break-in to contact the San Diego State University Police Department at (619) 594-1991, or by email at policeinvestigations@sdsu.edu. It’s the second time in the last two months SDSU’s Black Resource Center, which opened a little more than a year ago, has been in the news. On March 2, a person parked outside the building recorded a video in which a group of men appear to drive by off-camera shouting a racial slur. After that incident, the university issued a statement condemning the act and held healing circles on campus.